Bombay alias Mumbai has always been famous for its bustling city life and architecture that stands tall and serene in different corners of the city. 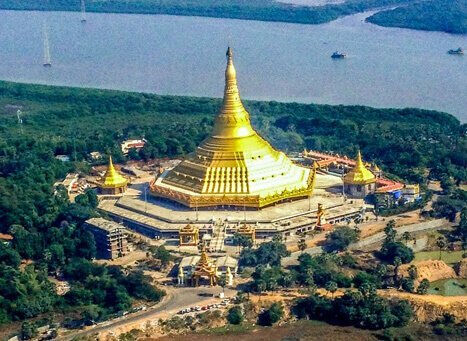 Far away from the hustle and bustle of Mumbai, is the privately developed structure called Global Vipassana Pagoda, which focuses on teaching and meditation form of Gautam Buddha. It is an inspiration of the well-known Vipassana meditation master, Acharya S N Goenka. Moreover, the pagoda is country's gratitude towards Emperor Ashoka and chain of Buddhist masters, who have been helping in protecting and preserving Buddhism teaching in India. A unique feature of Global Vipassana Pagoda is its mall 325 feet high hall, which took eleven years to constructed and is a replica of the Shwedagon pagoda in Myanmar. What makes Global Vipassana Pagoda even more interesting is that it houses genuine hair relic of the Buddha. Some of these relics were retrieved by the Archaeology department of the imperial British Government. According to the records, Global Vipassana Pagoda is world's largest pillar-less dome, designed especially for meditation. The main hall in the center heart of the structure is 280 feet in diameter and has a seating capacity of 8,000 people. Dhamma Wheel, the top keystone, suspended at height of 90 feet, weighs almost four tons. Along wth the main pagoda that has a height of about 325 feet, there are two smaller pagodas of 60 feet, built on the north and south. While the Northern pagoda features a meditation hall used for teaching Anapana meditation, the southern has around 108 meditation cells. Moreover, there is a vipassana center called Dhammapattana in the imposing complex, where student courses are conducted on daily basis. The center has approximately 100 air- conditioned rooms, audio-visual center and a meditation hall. Service facilities such as restrooms, offices, quarters and a food court are located on the ground floor of the basement area. Meditation is restricted in the inner dome of Global Vipassana Pagoda; it can be used only by those who undertake the 10-day residential course. Carved Myanmar Gate, a giant marble statue of Buddha, Bell Tower, and Gong Tower are the main attractions of the Global Vipassana Pagoda. Planning to make the Global Vipassana Pagoda began in 1997, but the construction started in 2000. The pagoda has three sub domes. First and the largest one amongst these three was completed in 2006. The first dome is world's largest structure containing relics of the Buddha. Construction of the third dome that sits atop the first was structurally completed on 21 November 2008. On 8 February 2009, the pagoda was finally inaugurated by Pratibha Patil, then President of India. Taxis and Buses are easily available in Mumbai to reach Global Vipassana Pagoda. Even it is approachable by a ferry service; take the Esselworld Ferry Service, costing Rs. 50 for a return trip, or the local ferry service, costing Rs. 5 for a one-way trip. The last ferry leaves to the Global Vipassana Pagoda at 5:25 PM. There is no entry fee or charge to see the Global Vipassana Pagoda. Also, there is no charge for the tour guides at Global Vipassana Pagoda.